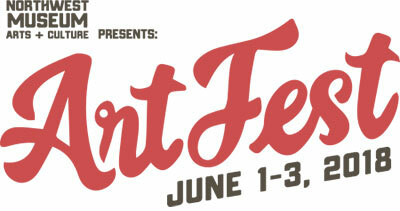 ArtFest presented by MAC this weekend! This Friday through Sunday, June 1-3, the Northwest Museum of Arts & Culture presents its 33rd annual ArtFest, an Inland Northwest tradition for the entire family. This outdoor festival of art, music, and food is also the unofficial beginning of summer, held on the weekend after Memorial Day. With historic Browne's Addition as the back drop, you'll see 150 juried art vendors presenting paintings, sculptures, photography, ceramics, jewelry and more. Kids can create their own art in our Make it Art Kids Fair. Enjoy a weekend of Northwest bands playing an eclectic mix of jazz, rock, country, reggae, funk, and folk music. And sample fare from some of the city's favorite food trucks and vendors. The Beer Garden will be serving No-Li Brewhouse 'Spokane Style Beer' and Townshend Wines. Congratulations to all the winners. Find more information on visitspokane.com. A Mikoyan-Gurevich MiG-17 'Fresco' airplane, third in a line of seven different models, will be on display at the Honor Point Military & Aerospace Museum. A reception will be held at the Museum this Friday, June 1 from 5:30-7pm. A brief history of the MiG and how the Museum acquired it will be presented. Appetizers and drinks will be served. Originally built in the Soviet Union, making MiG synonymous with 'Soviet fighter' to the Western world during the cold war. 9,000 were built and entered service in the 1950's and used extensively in the Korean War. Highly maneuverable, fast and versatile, it was the #1 threat against Allied Forces in Korea, eventually matched by the US made F-6. Don't miss this rare occasion to see this plane in person! Women & Children's Free Restaurant & Community Kitchen (WCFR) will be joined by Mayor David Condon and the WCFR Board of Directors to commemorate the completion of a demonstration kitchen and classroom project with a ribbon-cutting ceremony at N. 1408 Washington Street this Wednesday, May 30 at 1:30pm. The purpose of the new teaching space is specific to building WCFR's capacity to address the health disparities associated with food insecurity. WCFR teaches women who are experiencing poverty, homelessness, and food insecurity the nutrition knowledge, skills, and behaviors that can help them use their limited resources to nourish themselves and their children. The City of Spokane granted $147,000 for construction costs and equipment. STCU pledged an additional $25,000 to support the project. Western States Construction was the general contractor. WCFR is currently seeking funding for classroom furnishings and audio/visual equipment. For more information, visit www.wcfrspokane.org. Spokane Symphony Associates presents the 10th Annual 'Upscale Sale' this Friday, Saturday & Sunday, June 1-3, at 2512 E. 29th Ave. (Hastings Bldg.). Admission is free this weekend, and there is a $5 admission to the Preview Sale, which is this Thursday, May 31. Donors have generously given hundreds of beautiful items for this sale, including massive costume jewelry, household decor, furniture, fine china, antique and new table linens, and designer and/or vintage clothing, and much more. This sale happens only once a year and proceeds benefit the Spokane Symphony Orchestra. Hours are Friday & Saturday, 8am-5pm and Sunday 10am-5pm. You can view more images on their Facebook page, Upscale Sale Spokane. Lemonade day across Spokane County another success! Lemonade day is a program, presented by the Greater Spokane Valley Chamber of Commerce, that gives children of the Inland Northwest the opportunity to connect with their school districts and local businesses to help facilitate the learning of money management, cultivate entrepreneurial spirit, and encourage charitable contribution. This year's event on May 19 was a huge success, with 1,000 students completing the curriculum and nearly 200 students operating over 30 stands spread throughout the county. With stands on the North Side, Spokane Valley, and Liberty Lake, supporters all over the county had the unique opportunity of directly investing in the future of the Inland Northwest. For more information, visit spokanevalleychamber.org. For a fun-filled spring and summer, downtown Spokane is the place to be. Enjoy a free carriage ride through the heart of the city presented by the Downtown Spokane Business Improvement District and Wheatland Bank. The rides run 5-9pm every Friday in June and July (excluding Hoopfest weekend). Pick-up is on Wall Street across from the Wheatland Bank ATM. Rides are first-come, first-served; reservations are not taken. 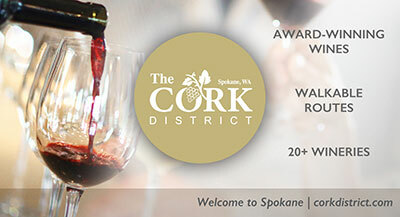 For more information, visit www.downtownspokane.org.